Message on Fundraising in the Middle of the Wilderness by Maria C. Khoury, Ed. D.
It is so difficult to write sometimes because I really do not know where to start. Do I start at the beginning before even my creation and think that I was with God and there was some type of special plan for me so I ended up in the Holy Land? Or do I simply start that I was born in Tripoli, Greece and I am so proud of my Greek ethnicity but had parents from the village that took me to the United States for better educational and job opportunities only to marry a husband that would bring back to the village. However, it is not an ordinary village that I am in right now as I sit on the highest mountain region of Palestine on the West Bank of the Jordan River overlooking the Dead Sea. At night I can see the lights of Jerusalem shining and on the other side the lights of Amman, Jordan. I am truly in the one and only 100% Palestinian Christian village left in this region after Christianity has survived over two thousand years of wars and bloodshed in a sacred land where our Lord was born, lived, crucified and resurrected and where Christians are dropping down to less than 1.6% of the total Palestinian population. When I begin to feel sorry for myself as a Greek-American in the middle of the wilderness and among people that are not anything like me where Muslims and Jews slaughter each other for the plight of the Promised Land, I simply look down at the Jordan Valley where Mary of Egypt spent more than forty years of her life and try to muster up some courage and strength from her devotion to the Lord in order to clean her soul and seek forgiveness where she came to this Promised Land just for the fun of it and for a free ride with pilgrims who actually led her to a life changing experience that she never dreamed about until she could not enter the Church of the Holy Sepulchre. It is documented in the Greek Orthodox Patriarchate that Mary of Egypt had a vision of the Virgin Mary who instructed her to go beyond the Jordan River and seek forgiveness of her sins. Thus the story of this great saint is constantly used as a role model especially during the Holy Lenten Season for many centuries. But for me being geographically right above the Jordan Valley, the story of Mary of Egypt, is a powerful reminder of the dedication and love people have for God. The only comfort that I have in this little small village and the only connection that I can feel as an Orthodox Christian in the middle of nowhere is that Christ did walk into this area known as Biblical Ephraim right before His crucifixion. "Jesus therefore walked no more openly among the Jews; but went thence unto a country near the wilderness, into a city called Ephraim..." (John 11:54). since that day biblical Ephraim took the modern name "Taybeh." . Our village of Taybeh is the only all Christian village that remains in Palestine twenty minutes outside Jerusalem before the ancient town of Jericho with 1300 residents all of whom are Christian and the majority is Greek Orthodox. All residents are Palestinians with a handful of outsiders. Following the l967 Israeli invasion of the West Bank thousands of people from Taybeh have emigrated to Australia, America and Europe due to the politics, bad economic situation and daily suffering faced under military occupation. The village is located between Jerusalem and Jericho in the biblical land of Judea. the Palestinian people seek freedom and self determination while my husband produced beer and I published children¢s literature to help promote values and traditions of the Holy Orthodox Church also knows as the Christina Books with the newest being Christina Goes to the Holy Land to promote a Christian presence in Palestine and the first out of seven being Christina Goes to Church to help children understand symbolism. I found myself as a Greek-American mother of three children that I could not even take to school because of the hundreds of military checkpoints set up all around us to protect the illegal Israeli settlers who have been living on confiscated Taybeh land since the invasion of the West Bank in 1967. I found myself driving on roads created for Jews only to by-pass the Arab villages where at night Palestinians would kill settlers and in the daytime settlers would shoot Palestinians. I could be a target for both since I was neither Palestinian nor Israeli and I spent several months physically shacking like a drug addict as I drove to school. For several years I would leave my home at 6:45 a.m. never knowing if I would return in the afternoon. There is nothing else to feel when people all around you kill each other daily and you could simply die by being in the wrong place at the wrong time. Although I have always believed in Christ since I was born into a Greek Orthodox family and raised by devout parents, it is particularly in this war situation that I felt my life on earth is meaningless and seeking a life with Christ is what God calls upon us to do. I thought that my life on earth can end at any moment and besides the fancy house, the expensive jewelry, the luxury car what treasures do I really have that are everlasting? The violence in our area was so intense and the checkpoints so many that I also lost my job as an educator with the Latin Patriarchate Schools and contributed to the 60% unemployment rate of Palestine. As a professional person I felt into a deep depression not being employed and furthermore I felt even more depressed since my husband could not leave or did not want to leave and return to Boston. In my small mind I grew up thinking that the family is the mom, dad and the kids but in Palestine the family is also the grandparents and all the aunts and the uncles. My husband could not escape to freedom while leaving his family behind. I really had to struggle to be an obedient wife and to wake up to a man every morning that I began to think of as my enemy but in front of God had taken vows to honor and to respect. I was frustrated that the extended family was more important than me. I am sure now this is the reason that Palestine has being emptied out of its Christian population since 1948 with the creation of Israel because when one person relocates outside the country, they actually just take everyone else with them meaning the whole extended family or clan. with everyone but I promote specifically that Palestinian Christian people should have their basic human right to stay where they were born and their parents were born instead of being squeezed out by the Zionist policies of making a 100% Jewish homeland for Jews only. I have tried to find some type of meaning in my life living in war and unemployed and living as a foreigner in a country that I never really wanted to come too and can list at least fifty reasons why I do not want to live in a Palestinian village. But the one reason overshadows all the others and that is my faith in God. I make every effort to trust in the Lord¢s plan for me and to understand why certain things have happened to me thus helping me take my next breath in moments when I felt like dying. I try very hard to believe that when God shuts doors of opportunity for you it means you have to open not just your eyes but your heart and soul to find the windows of opportunity in His Divine Plan for each and everyone of us which basically these days I truly feel it is only to give glory to God and worship our creator. As humans, we are put here on earth to struggle and through the pain and suffering to make efforts to speak to God. I truly believe I would be speaking to God less if I continued to live in my middle class house in Boston, taught at Boston University, took my children to hockey, soccer and Greek School and tried to have a beautiful vacation each summer because basically I would be so busy and on such a perfect and wonderful routine that I would not need God. You do not need God when you are engulfed in the materialism of this world. I know God through pain, suffering and struggling at all levels, physical, emotional, mental and spiritual. I know God because I tried to understand the road in life He put before me and how is it that I could use my skills and knowledge to give Glory to His Holy Name. I know God because I tried to carry my cross with faith and dignity and when my cross was so heavy it is really God who sent people who might have even been angels, I am not sure, but they prayed for me, they inspired me with their personal faith in the Lord, they encouraged me to trust in God and they reminded me that God loves me and never would put me in a situation that I could not handle because He truly knows my heart and strength. I know God only by pure faith. I know God only by others who have inspired me by their presence. During the ceremony, Orthodox Christians remember that Christ is the One Who has smashed the gates of Hades and opened the gates of Paradise, and gone before us! Seeing the Life-Giving Tomb of Christ is another reminder of our final destiny. As a small Christian community we want to witness and reflect Christ-F¢s eternal love. We pray for peace and hope Jerusalem can be an open city of all faiths so Christian pilgrims from all over the world can come and be inspired and spiritually uplifted by the true Light of Christ and share the richness of the Christian roots that exist in the Holy Land. non-violent resolutions to oppression and condemn violence. It is very important to keep a Christian presence in the Holy Land to witness for Christ¢s peace and love for neighbor. Thus I live day by day trying to understand the gospel and especially since 2000, I have made every effort to serve the Church of Saint George in Taybeh as a volunteer specifically for a housing project to help young couples build their first home. Thirty families were on the list to save about $100 each month (if they could) to be part of a housing cooperative that would help them obtain land to use for free from the Greek Orthodox Patriarchate in Jerusalem. A committee would fundraise to help assist these needy families whom none had $50,000 up front to build their home. Nine years later and finally with the help of the Metropolis of Boston, the Virginia Farah Foundation as the largest donor, and many churches and individuals across the world the first $90,000 was raised to start building these homes. Frustrated with lack of funds since 1997, half of the members of the housing project dropped out and withdrew their personal savings since the church did not have enough money to start the project. The twelve families that continued the hope were ideally supposed to contribute $12,000 each from their savings to match funds raised although a few are still short and cannot come up with this amount August 1, 2005, the ground breaking day for the housing project, was the day I had prayed for many years and people across the world had prayed with me and this is the major reason I have been able to maintain inner peace and continue to serve the church although we embarked on years of daily bloodshed and violence all around us with the Israeli/Palestinian conflict with the Muslims and the Israelis slaughtering each other while the Christians are stuck in-between. On August 1, 2005 the land allocated by the late Patriarch Diodoros was leveled for six duplex buildings that would help house twelve families as my late father-in-law, Canaan David Khoury had planned as the founder of the project. In order to maximize job creation, six different contractors built the units and all workers that specialized in this labor had temporary work from August 2005 until April 2006 when finally the skeleton structure of twelve homes was completed. Now the families are responsible to finish their homes from the inside because we have tried every humanitarian organization in the book and none exist to help with building private homes. I personally feel if it took me that many years just to raise what my catholic colleagues can raise in a week then probably I need another life time to finish these homes especially since we are in a deficit of $48,000. However, I do believe in miracles and in great friends like Marilyn Rouvelas, author of A Guide to Greek Traditions and Customs in America who helped me understand I must do a lot of ground work to help raise awareness about the Christian presence in the Holy Land and who trusted I could do this through books resulti ng in the publication of Christina Goes to the Holy Land for children. A colorful book that walks the footsteps of Jesus with the message that Christians need help to stay in the Holy Land. Editor's Note: Dr. Maria C. Khoury is the author of seven Orthodox Christian children's books including the latest, Christina Goes to the Holy Land . 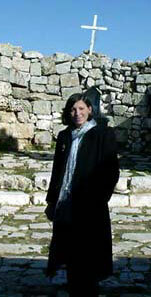 She is a graduate of Hellenic College , Harvard University and Boston University . She lives in the Occupied Palestinian territories with her husband David C. Khoury, also a Hellenic College graduate and founder of Taybeh Beer the only microbrewery in the Middle East and the only Palestinian Beer established in l994 following the Oslo Peace Agreement.